Every school is different, but all schools face very similar challenges. Drawing on their combined teaching experience of over fifty years in both independent and state schools, educationalists David James and Ian Warwick have chosen ten questions that tackle the most difficult challenges that face schools today, and invited leading education experts to address them in stimulating and accessible essays, which are each under a thousand words. With contributions from John Hattie, David Blunkett, Doug Lemov, Anthony Seldon, Sandy Speicher, Tim Hawkes and many more, this insightful and engaging book features exclusive essays with some of the world’s most well-known and well-respected thinkers and speakers in education, business and politics, accompanied by thought-provoking introductions. The contributors provide new perspectives on some of the issues that occupy educationalists today; they challenge conventional wisdom and, above all, put forward practical, workable, evidence-based solutions that can transform teaching and learning. 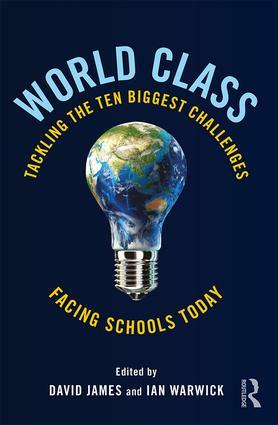 World Class is a powerful manifesto for change that nobody interested in education today can ignore. How can we improve teaching? How can teachers become specialists in their subjects? How can we improve professional standards? How should we test our students? How independent should schools be? How can we improve student behaviour? What technology should we use in the classroom? How can school progress be most effectively measured? What does outstanding leadership look like?